The role of a storyboard artist is to read a script, and see the film or story unfold in front of you. They’re handed the pieces, and it’s their job to complete the puzzle. Not only that, in a way, they take on the task of fleshing out the world as well as working as an actor knowing how the character would move through their life on-screen. 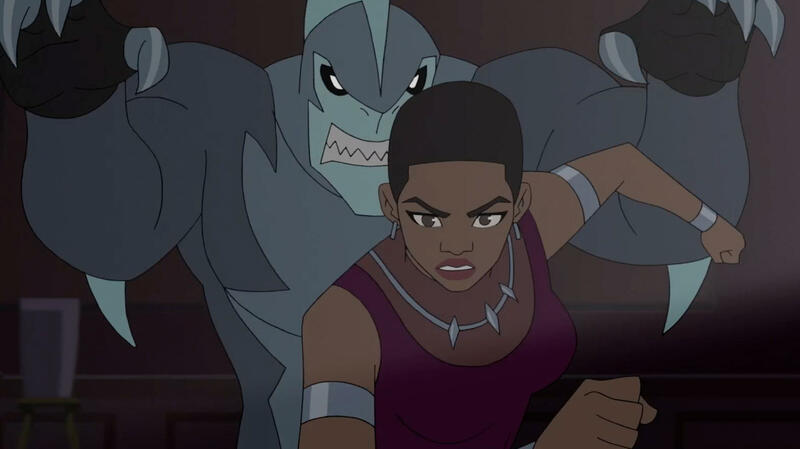 One of these multitaskers is Jessica Cuffe, a storyboard artist on “Marvel’s Avengers: Black Panther’s Quest.” Marvel.com had the opportunity to sit down with Cuffe about “Black Panther’s Quest,” animated programs as a universal medium, the NAACP Image Award nomination for “Black Panther’s Quest,” and more! Marvel.com: How did you get the opportunity to join “Marvel's Avengers Black Panther's Quest”? Jessica Cuffe: I had been working as a revisionist on “Marvel’s Avengers Assemble” and had gotten the chance to get my feet wet as it were. Then boarding with “Marvel’s Guardians of the Galaxy,” and then some stuff for “Marvel’s Spider-Man.” My director Tim Eldred, he came by and asked "Hey, you know we've been seeing how good your work is. We really like what you do. 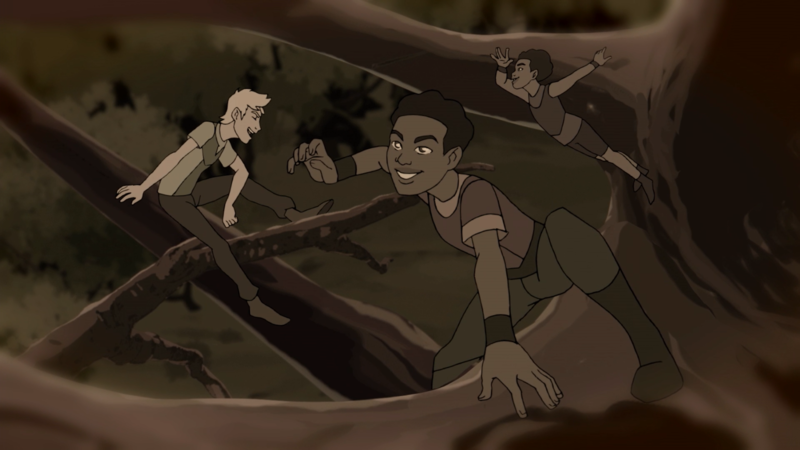 Would you be interested in hopping on to “Black Panther's Quest"? I was definitely excited! It was after being able to show what I could do and building up a rapport with the crew and everything that I was offered the opportunity. Marvel.com: What was it like working on “Black Panther's Quest”? How collaborative is the role of the storyboard artists in relation to like the writer, directors and producers? Jessica Cuffe: It's collaborative—especially being a part of the crew for at least a year and a half, two years already—is that we're all of a similar mindset. I've been able to speak with my directors very candidly about "Hey, this part of the script is really great. Can I embellish on it?" Or "Is this the direction that you want to go versus how it's kind of sounding in the script?" It’s a very healthy back and forth trying to really build a cohesive story. Marvel.com: Between the stories from Reginald Hudlin, Christopher Priest, Ta-Nehisi Coates, Evan Narcisse and Ronald L. Smith, and also last year's momentous film, Black Panther is definitely a fan-favorite; he means a lot to people. 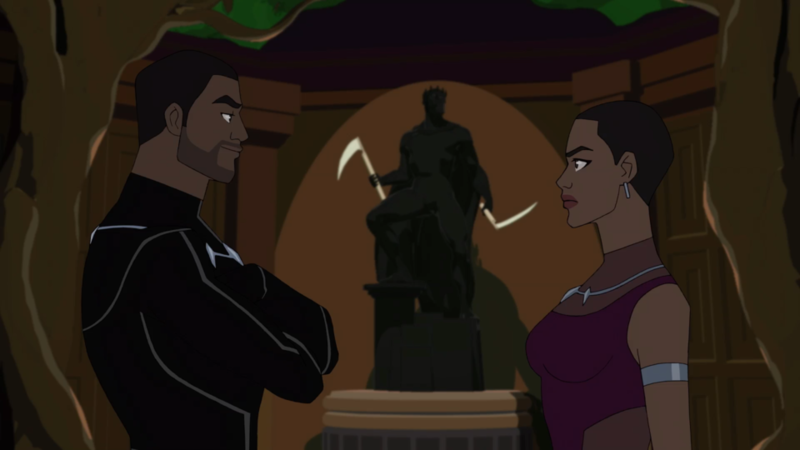 What was it like to get to get to tell your own Black Panther story on “Black Panther's Quest”? Jessica Cuffe: It’s just really great. It made me feel great even on a fan-level because I've loved comic books since I was a little girl. My mother got me into comic books when I was super young. But like I've been reading stuff for Marvel, DC, and Dark Horse, and seeing all of these different stories growing up, I was really excited to tackle Black Panther because from the first script I read, this was the kind of character who I was excited to make human. Black Panther is a genius. He's an amazing strategist, but he's also king of an entire country that's technologically-advanced. Those are some really high-level stats for a guy. It was exciting to delve into how he processes the world around him, how he interacts with his sister, how he becomes great friends with Cap, especially since he has to practically ostracize all his other friends that really do want to help him. They want to understand why he's doing this but as a King, as a strategist, you can't just show all your cards and so it was interesting and exciting to tackle how human T'Challa could be. Marvel.com: There’s this whole perception of animated programming as just for young children. But the story that you told this past season was really touching, and it was intense. What was it like just being a part of that? Jessica Cuffe: It was awesome, it really was. It was exciting every day to be able to come in and see the voice actors really dig deep and get into it; being able to talk with Tim or Jeff Allen, who was the supervising director, even our producers. Some of my favorite parts were being able to have the interactions between the family. You've got Scott Porter, you've got Daisy Lightfoot, and James Mathis III, and their dynamic as siblings together was just so great. The highs and the lows, and with Roger Craig Smith being Captain America. Even Cap had moments where he pulled in his humanity like when Zemo shows up. It's all these very complex relationships that we trust in our viewers; it's not just kids watching it for just straight entertainment. It's them and their parents and other young fans and older fans. We wanted to make sure to have this, at the very least emotionally accessible and relatable to everyone because folks have siblings. Folks have friends that they might not agree with. They have friends that they do agree with. They have a lot of moments where they can't tell everybody everything, but they're trying really, really hard to help. And sometimes it doesn't work out and sometimes it does. The consequences will reveal themselves after, so it was so cool to tackle something that complex. Marvel.com: A lot of people also don’t realize that animated schedules are so far out; production for this began well before the film did. What I loved is the authenticity, like James and Daisy crafting the Wakandan language, what the accent should be. What did you want people to come out of this show knowing about Wakanda? Jessica Cuffe: We wanted to expand, at the very least, have people see past this country just being this technological marvel. Everything in Wakanda is amazing, but it is also still a country. It's not a straight utopia. There are characters and people like M'Baku, who is from Wakanda, but he is also part of this criminal element that T'Challa has to end up dealing with. 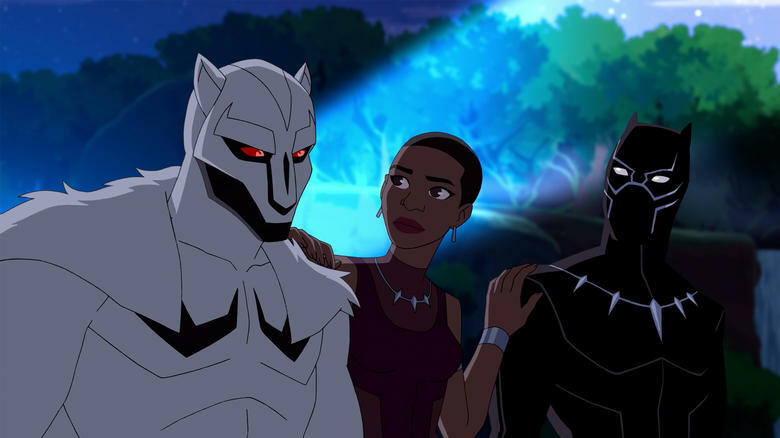 Then there are other characters like White Wolf that come in and interact with T'Challa and Shuri. We wanted to build upon the fact that Wakanda is very much alive. It's not just super-advanced technology and then we only focus on T'Challa and Shuri. There's so much more history. It's so in-depth. We have full episodes that expand upon Wakanda's history especially with other Avengers, like going back to T'Chanda, T'Challa's grandfather, interacting with Captain America and Peggy Carter. Even then it’s still very technologically-advanced, it's still very much a remote society. We had to expand upon how someone from that kind of a setup would interact with the rest of the world. Building upon the creation of Wakanda with Bashenga and Bask, the struggles they had to go through and the catalyst for why they created Wakanda, that was something that we wanted to maximize on. Marvel.com: What does Wakanda and Black Panther, as a person, his stories, what does this mean to you personally? Jessica Cuffe: Black Panther means a lot to me because I'm also an older sibling and my brother is an incredibly smart guy. He is someone that's able to keep in perspective the larger picture. While still understanding the details versus how I'm someone who definitely loves seeing the big picture but I'll move so far forward in the big picture that I'll miss some of the details so we work well together in envisioning what's going on in kind of the same level with T'Challa and Shuri. They work so well together and they understand each other so well that both of them become one whole person. This family bond that they have with each other is just so strong and so tight. And as an older sibling, it's something that I can relate to but also want to aspire to have. The concept of family through this whole season, whether it be family that you're born with or family that you choose with White Wolf and in Captain America is such a strong message. It's such a solid message that is consistent through every episode that shows up. While boarding, I feel that I'm also watching how this story unfolds. It was always exciting to see the next thing that happened to T'Challa because I could relate to him. Jessica Cuffe: That's like choosing your kids! I have two moments, and two episodes that I'm especially proud of; I was really excited about. They both feature one of my favorite characters in the season—White Wolf. He introduced such a great dynamic to T'Challa. T'Challa and Shuri are overall on the same page the whole time, except when Shuri is right. But White Wolf comes in with a completely different way of thinking, and it's great to see that challenge against T'Challa, whether it works for him or against him. One of my favorite episodes is “The Good Son.” I believe that's what we ended up calling it. It's where T'Challa finds out that Hunter is actually going to steal the key. Twist! But I got to tackle one of the scenes that I've been calling it the breakdown in relations. White Wolf is found with Zemo in T'Challa's bedroom claiming that Zemo was trying to come and steal the key. T'Challa comes in and sees the scene. We have no previous context outside of what Hunter has said. Seeing T'Challa view the big picture and seeing things not add up, taking a moment in a beat to kind of walk around and then keying in on something important such as how did Hunter know that the key was in the bedroom when nobody else knew up until five minutes ago? Hunter then finally reveals that as much as he cares so very deeply for Wakanda, for his brother and his sister, he is dead set on viewing that they are being either played or something is not right with the plan that they're going through with so if Hunter has to save the day, he's gonna. T'Challa doesn't understand why Hunter would betray him like this. He's been helping him the whole time. That was such a great solid moment. I was so excited. Then the second episode is one of our finales. It's the Atlantis Attacks. This was a moment that my director Tim came by and he's like "Hey, I know how much you like White Wolf. I saved this scene for you." And I'm like "Yes!" It's the scene at the very end of the episode where sadly White Wolf dies. After everything that we've been able to accomplish in this season, building up how solid these relationships are or breaking them down, how much that means to certain people when it finally comes to it, no matter what, they're family. Hunter comes and gives T'Challa the crown. Tiger Shark shows up. Oh man, Tiger Shark. Every five minutes this fish guy. He shows up and is trying to interrupt, trying to keep them from winning, but Hunter is like "I am going. I have always been loyal to you. You have to go do this. You are the only one that can do this. I will have your back." And he does, all the way up to the end. When Bask finally fades, when the crown finally fades after T'Challa gives some words to Alana, who is now the new warlord of Atlantis, he hears his sister and this is just—I’m so excited about it. He hears his sister scream his brother's name. And we all know, we all know what that feeling feels like. It's just this drop in your stomach. It's this pit in your heart and you're like please god, no please no. The second he comes around the corner, he sees it. He sees his sister hugging his brother and it's this very solemn, sad moment because out of everything that he's done in his life to annoy T'Challa, to make him angry, to push against him, to push against his boundaries, after everything, he's still his brother. That was a deep, emotional resonance that I had with that scene, and I was so pleased, and I felt really blessed to be able to tackle that. Then Tiger Shark shows back up, as I'm even going through the boards, I'm "Dude this is not the time." But he still comes in, just this zealot spouting words, "We will never be at peace! Atlantians will always be against Wakanda!" T'Challa is just too emotionally destroyed to deal with this, and he almost loses who he is because he's so distraught over his brother's death. Shuri brings back those family ties, stops him because she knows you can't you can't cross that line no matter what has happened to you. I know it hurts. You cannot do this. You are better than this. You are better than he is. So having that very solemn yet very incredibly strong family moment was so special. 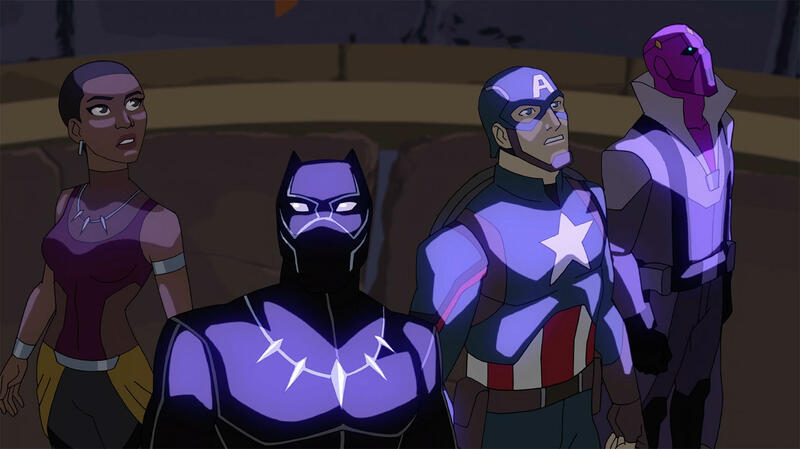 Marvel.com: These episodes really demonstrate why the show was nominated for the NAACP's Outstanding Children's Programming award. What was it like when you learned that you guys were nominated? Jessica Cuffe: I kind of didn't believe it. I was, “Wait what?" I was really excited because I got this chance to follow all of our actors. I mean it's so incredible. Amazing voice talent and the experience and emotion that they bring to these characters is just so rich and getting the chance to meet several of them. On social media, I saw quite a few of them post about "oh my gosh, NAACP Award! Oh my gosh." And I was like "What?!" So that was that was really exciting because we all felt so strongly and so passionately for this season like we were 150% in it and to have that recognized is amazing. Marvel.com: You’ve got action, but you also got like this whole family story and you get to tell the story of a character who's having a big cultural moment. Black Panther in different mediums is represented and recognized at the NAACP Image Awards this year. Jessica Cuffe: Yes, it's pretty crazy. Marvel.com: What is the one thing that you would like to say for for those who haven’t jumped on board yet? Jessica Cuffe: I'd like to say that with how it how wide-spanning—not just the Marvel Universe but super heroes in general—with how huge their worlds could be, with how far they go, people tuning into this season are going to get a chance to focus on who someone is. Being caught up in a lot of flashy action or being intense with the superpowers and seeing explosions and aliens and all kinds of crazy stuff with as big as that can be, having this almost laser focus on a personal story about one of these people that has to live in this world, it’s just so captivating. It's definitely one of the biggest draws that I have had through my life of reading comics or being introduced in super heroes, action movies or films in general, cartoons in general is being able to see who someone is outside of the heroism. To really understand who this person is because that's what you connect to. His suit is great. But you don't connect to the suit. You connect to the guy. It's the same thing with Captain America, with previous seasons with that we've had “Avengers Assemble,” with Hawkeye, with Black Widow. You want to know who these people are and how they see the world, not how the world sees them. Marvel.com: “Black Panther’s Quest” ran for several months every weekend, you are basically invited into people’s families, into their homes. More than just a two-hour film, you are with them experiencing their journey for hours, for months. Jessica Cuffe: For how popular super heroes have gotten in the past decade and a half, that is something that always draws an audience into the hero's journey. It's a classic tale going back to Greek mythology. And even before then, following a person who may have extraordinary abilities or the best tools but they are going on a journey and how they process how this journey affects them is what draws people into it. It's why someone would want to watch. So seeing T'Challa go through his journey and how he becomes—not just a bit different but a better person on top of being a better hero, by the end is what I would want someone to know while watching this season.